130 mm/55 B-2-U4 х 2 pcs. 533 mm Quintuple 2-N2 х 5 pcs. 37 mm V-112 х 2 pcs. 12.7 mm DShK4 х 1 pcs. Khabarovsk — Soviet Tier X destroyer. The ship was designed as a destroyer flotilla leader. No destroyer in the world could rival her in terms of speed, while her armor and the power of her artillery were comparable to those of light cruisers. Dual-purpose main guns and a battery of automatic AA guns ensured a strong AA defense. The Khabarovsk is the epitome of the "running and gunning" method of Soviet destroyer leaders. First: the running. She puts the "top" in top speed: at 43 knots, half a knot faster than her predecessor Tashkent, her speed is matched only by her cousin Leningrad. With Sierra Mike ( ) signal and Engine Boost ( ) active, this increases to an eye-popping 48.7 knots! A powerful engine gives her great acceleration as well. On the other hand, her turning radius is quite large and her base rudder shift is extremely poor; upgrades are needed to improve her maneuverability to manageable levels. And while she can run, she can't hide: her base concealment is a massive 10.0 km, and in practice can be worse than some cruisers. Next: the gunning. She fires the same shells as Tashkent at the same rate of fire per barrel; however, she gains a fourth turret, as well as a slightly higher muzzle velocity and much faster turret traverse. Together this allows her to put a withering storm of fire on any target, and switch targets quickly as conditions dictate. Her range does decrease somewhat, forcing her to fight a little closer to the action. While she does not have the range or maneuverability of Tashkent, she shares similar advantages of a very large health pool for a destroyer and access to Repair Party ( ). Most notable, however, is the 50 mm plating about her midsection; this "chestplate" can shatter most cruiser HE shells, and at extreme angles, even bounce battleship AP shells. However, this and her large size for a destroyer can occasionally backfire, arming AP shells that would merely over-penetrate smaller, more lightly-armored destroyers. Optimal angling will depend on the enemy guns and their shell selection. Her decent AA for a destroyer can shoot down the occasional plane, though cannot be expected to make much of a dent in a carrier strike, especially given her lack of a Defensive AA Fire ( ) option. The torpedoes are mostly a curiosity. With a 6.0 km range — quite low for her tier, ship concealment, and role — they will see little use in the majority of games. They are also very slow; only slightly faster than the ship they were fired from! However, they do have one special feature: as the first electric torpedo introduced to the game, their detection radius is a tiny 0.6 km, meaning that a close pursuer or smoke camper without Hydroacoustic Search ( ) will have almost no chance to react. Fastest ship in the game, at 43 knots. When equipped with Sierra Mike ( ) signal flag and running Engine Boost ( ) it becomes 48.7 knots. Decent range of 13.5 km with Advanced Firing Training. While not as long as Tashkent, enemies will still have trouble hitting her at this range. The main battery guns, though small, are numerous and have good damage and fires per minute. The ballistics are phenomenal, and traverse speed is also very good. Giant HP pool makes you able to take a lot of hits. Armored midsection can shatter all destroyer and most cruiser HE shells. Has access to the Repair Party ( ) consumable. Large size makes it easy to be hit if not moving, and you may take penetrating hits instead of overpenetrations from battleships if angled. Large turning circle, and extremely poor rudder shift when unupgraded. Largest detection range of a destroyer makes it difficult to push into capture points. Torpedoes have poor speed and anemic range. As a Tier X ship, Khabarovsk has no additional modules to research. Slot 1: Main Armaments Modification 1 ( ) is the conventional choice, though captains worried about detonations and lacking Juliet Charlie ( ) signals might instead opt for Magazine Modification 1 ( ). Slot 2: Propulsion Modification 1 ( ) protects Khabarovsk’s main defensive asset: her speed. With Steering Gears Modification 3 in the fifth slot, rudder durability is not really an issue. Slot 3: Aiming Systems Modification 1 ( ) will make it easier to land hits at range. AA Guns Modification 2 is the only other choice even worth considering, but without Defensive AA Fire it is much less useful. Slot 5: Steering Gears Modification 3 ( ) are all but mandatory due to Khabarovsk’s terrible stock rudder shift. Slot 6: Main Battery Modification 3 ( ) is the only correct choice given Khabarovsk’s gun emphasis. The excellent base turret traverse makes the penalty all but unnoticeable. Captains who have one of the rare Engine Boost Modification 1 ( ) upgrades and have the Sierra Mike ( ) signal equipped are encouraged to replace the Propulsion Modification 1 upgrade, as it extends the Engine Boost ( ) consumable duration by 50%, thereby allowing her to maintain a max speed of 48.7 knots for three minutes. Due to the fabulous speed of Khabarovsk, many players find the Smoke Generator ( ) consumable unnecessary and now choose to mount the Repair Party ( ) consumable for longer survivability. 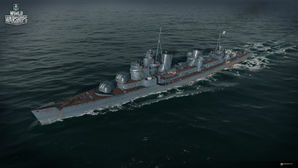 Players who wish to spend doubloons can equip Khabarovsk with Type 20 camouflage that lowers her detection radius, reduces the accuracy of incoming shells, reduces her repair costs, and increases the amount of experience she earns. Like Tashkent, Victor Lima ( ), India X-Ray ( ), Sierra Mike ( ), and Juliet Charlie ( ) are the most recommended signals. Additionally, because Khabarovsk has access to the Repair Party ( ) consumable, players using said consumable are thus highly recommended to also mount India Delta ( ). Zulu Hotel ( ) and Dragon Flag ( ) are recommended for captain (re)training. Players can opt to mount Zulu Hotel to stack the effect of the premium permanent camouflage credit earning bonus. The Khabarovsk as it appears in World of Warships is a representation of the 1936 3400-ton Project 47 armored destroyer design. Contrary to the in-game description, Khabarovsk did not rival other contemporary destroyers because it never existed in metal to begin with. The French Le Fantasque-class is actually the fastest type of destroyer ever built. This page was last modified on 23 April 2019, at 05:08. This page has been accessed 85,956 times.